Helping Children Succeed: What Works and Why– In How Children Succeed, Paul Tough introduced us to research showing that personal qualities like perseverance, self-control, and conscientiousness play a critical role in children’s success. Now, in Helping Children Succeed, Tough takes on a new set of pressing questions: What does growing up in poverty do to children’s mental and physical development? How does adversity at home affect their success in the classroom, from preschool to high school? And what practical steps can the adults who are responsible for them—from parents and teachers to policy makers and philanthropists—take to improve their chances for a positive future? Tough once again encourages us to think in a brand new way about the challenges of childhood. Rather than trying to “teach” skills like grit and self-control, he argues, we should focus instead on creating the kinds of environments, both at home and at school, in which those qualities are most likely to flourish. Mining the latest research in psychology and neuroscience, Tough provides us with insights and strategies for a new approach to childhood adversity, one designed to help many more children succeed. Smart but Stuck – This book offers 15 true and compelling stories about intelligent, capable teens and adults who have gotten “stuck” at school, work, and/or in social relationships because of their ADHD. Dr. Brown highlights the often unrecognized role that emotions play in this complex disorder. He explains why even very bright people with ADHD get stuck because they can focus well on some tasks that interest them, but often can’t focus adequately on other important tasks and relationships. The ADHD Advantage: What You Thought Was a Diagnosis May Be Your Greatest Strength – For decades, in the United States and in countries around the world, physicians delivered the diagnosis of ADHD to patients as bad news and warned them about a lifelong struggle of managing symptoms. But The ADHD Advantage explodes this outlook, arguing that some of the most highly successful entrepreneurs, leaders, and entertainers have reached the pinnacle of success not in spite of their ADHD but because of it. 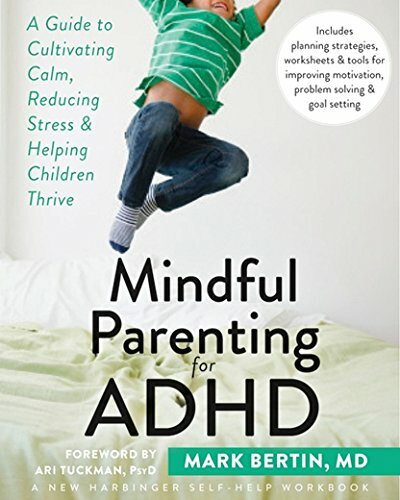 Mindful Parenting for ADHD: A Guide to Cultivating Calm, Reducing Stress, and Helping Children Thrive – Written by a pediatrician and based in proven-effective mindfulness techniques, this book will help you and your child with attention deficit/hyperactivity disorder (ADHD) keep calm, flexible, and in control. If you are a parent of a child with attention deficit/hyperactivity disorder (ADHD), you probably face many unique daily challenges. Kids with ADHD are often inattentive, hyperactive, and impulsive, since ADHD affects all of self-management and self-regulation. As a result, you might become chronically frustrated or stressed out, which makes caring for ADHD that much harder. In this book, a developmental pediatrician presents a proven-effective program for helping both you and your child with ADHD stay cool and collected while remaining flexible, resilient, and mindful. Bertin addresses the various symptoms of ADHD using non-technical language and a user-friendly format. In addition, he offers guidelines to help you assess your child’s strengths and weaknesses, create plans for building skills and managing specific challenges, lower stress levels for both yourself and your child, communicate effectively, and cultivate balance and harmony at home and at school. If you are a parent, caregiver, or mental health professional, this book provides a valuable guide. Smart but Scattered: The Revolutionary “Executive Skills” Approach to Helping Kids Reach Their Potential – There’s nothing more frustrating than watching your bright, talented son or daughter struggle with everyday tasks like finishing homework, putting away toys, or following instructions at school. 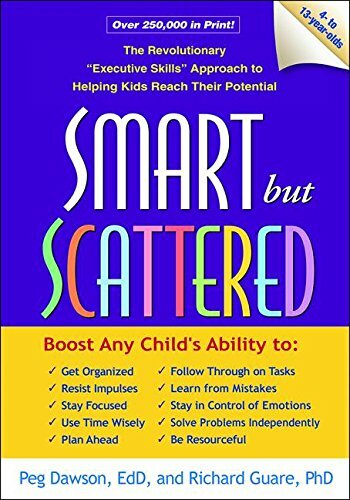 Your “smart but scattered” child might also have trouble coping with disappointment or managing anger. Drs. Peg Dawson and Richard Guare have great news: there’s a lot you can do to help. In this step-by-step guide, Thom Hartmann explains the positive side of Hunter behavior. He reveals how Hunters make excellent entrepreneurs, sharing ADHD success stories from Fortune 500 CEOs, inventors, small business owners, and his own hands-on experience in launching new businesses. Drawing on solid scientific and psychological principles, he provides easy-to-follow organizational strategies, tips to maintain focus and create a distraction-free workspace, and tools to set goals, build a business plan, and discover the right business project to keep you motivated. Revealing the many ADHD opportunities hidden within the challenges of work, relationships, and day-to-day life, Hartmann also includes tips on navigating family relationships and parenting–for most Hunter parents are also raising Hunter children. Parenting Children with ADHD: 10 Lessons That Medicine Cannot Teach – Over the past 30 years, Dr. Monastra has treated more than 15,000 clients who have ADHD. In this important book he shares the knowledge he has gained. 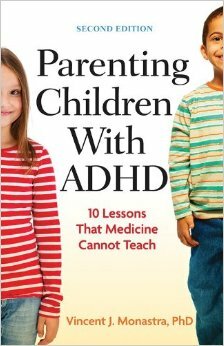 Engaging and straightforward, the book is directed at parents of children who have, or might have, ADHD. In a conversational style, Monastra offers a series of sequential lessons, beginning with the causes of ADHD and the most common medical treatments. He discusses all the relevant issues for parents, including psychological treatment, diet, educational laws, and practical coping strategies for both parents and children. Dr. Monastra’s research examining the neurophysiological characteristics of children and teens with attention-deficit/hyperactivity disorder (ADHD), as well as his treatment studies investigating the role of parenting style, school intervention, nutrition, and electroencephalographic (EEG) biofeedback in the overall care of patients with ADHD, is internationally recognized and has led to several scientific awards, including the President’s Award. Taking Charge of Adult ADHD – For adults with ADHD, problems with attention, planning, problem solving, and controlling emotions can make daily life an uphill battle. Fortunately, effective help is out there. No one is a better guide to how to get the best care—and what sufferers can do for themselves—than renowned ADHD researcher/clinician Russell A. Barkley. Dr. Barkley provides step-by-step strategies for managing symptoms and reducing their harmful impact. Readers get hands-on self-assessment tools and skills-building exercises, plus clear answers to frequently asked questions about medications and other treatments. Specific techniques are presented for overcoming challenges in critical areas where people with the disorder often struggle—work, finances, relationships, and more. 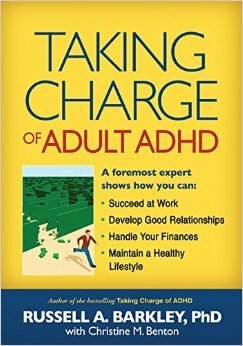 Finally, an authoritative one-stop resource for adults with ADHD who are ready to take back their lives. . Adolescents and Adults with Learning Disabilities and ADHD: Assessment and Accommodation – Most of the literature on learning disabilities and attention-deficit/hyperactivity disorder (ADHD) focuses on the needs of elementary school–age children, but older students with these conditions also require significant support. Comprehensive and authoritative, this book helps you navigate the maze of laws, policies, and scientific research relating to diagnostic and intervention decision making for adolescents and adults. Healing Developmental Trauma: How Early Trauma Affects Self-Regulation, Self-Image, and the Capacity for Relationship – This book is written for those working to heal developmental trauma and seeking new tools for self-awareness and growth. It focuses on conflicts surrounding the capacity for connection. Clinicians Laurence Heller and Aline LaPierre explain that an impaired capacity for connection to self and others and the ensuing diminished aliveness are the hidden dimensions that underlie most psychological and many physiological problems,They introduce a unified approach to developmental, attachment, and shock trauma that, while not ignoring a person’s past, emphasizes working in the present moment. Their approach helps bring into awareness the parts of self that are disorganized and dysfunctional without making the regressed, dysfunctional elements the primary theme of the therapy. It emphasizes a person’s strengths, capacities, resources, and resiliency and is a powerful tool for working with both nervous system regulation and distortions of identity such as low self-esteem, shame, and chronic self-judgment. Learning to Slow Down and Pay Attention: A Book for Kids About ADHD – The third edition of Learning to Slow Down and Pay Attention, by clinical psychologists Dr. Kathleen Nadeau and Dr. Ellen Dixon, reflects changes in the understanding of ADHD and in our approach to its treatment.. 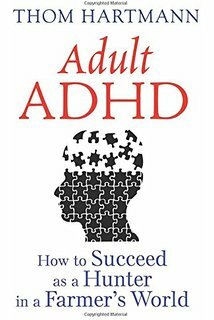 While the majority of what’s written about ADHD emphasizes behaviors that bother adults, this book emphasizes those aspects of ADHD that are troublesome to the children, trying to look at the world more from their point of view. Packed with practical tips, know-how, and fun, this friendly workbook just for kids has solutions for every situation — at home, at school, and with friends. The new edition also contains updated and expanded notes and resources for parents.